Teignmouth is ‘proper’ seaside. Nostalgia at its best. The perfect place to sit on the prom with a bundle of fish and chips or a melting 99 and gaze out to sea. It stirs happy memories of Sunday School treats and family daytrips, rare and precious occasions when all generations squeezed gleefully into the old Vauxhall amongst Thermos flasks and picnic baskets full of egg sandwiches and fruitcake. There were no seatbelts or child car seats – we filled the car, lap on lap, until the doors would barely shut. And at the end of the day, home we wended wearily, bronzed and burnt by the sun, boot full of buckets of shells, flowered bathing hats and soggy sandy bathing suits, pre-Lycra fashions with flippy little skirts and odd ruching that filled with seawater like diving weights. Or that’s how we love to remember them. And it seems we’re also loving recreating those treasured recollections, which are just long enough ago to have lost any less-than-lovely memories of shivering behind a windbreak. It’s like having babies – wait 10 years and you can describe it as the best experience of your life. Thus Cath Kidston’s gorgeous 2016 nautical ‘Sea View’ fabric is the height of fashion, though it looks just like the colour-washed print of our 1950s cotton frocks (with the odd jet ski thrown in as a nod to the 21st century). So back to Teignmouth on Devon’s south coast… it’s the place to bring your children and show them what life was like in ‘the good old days’. 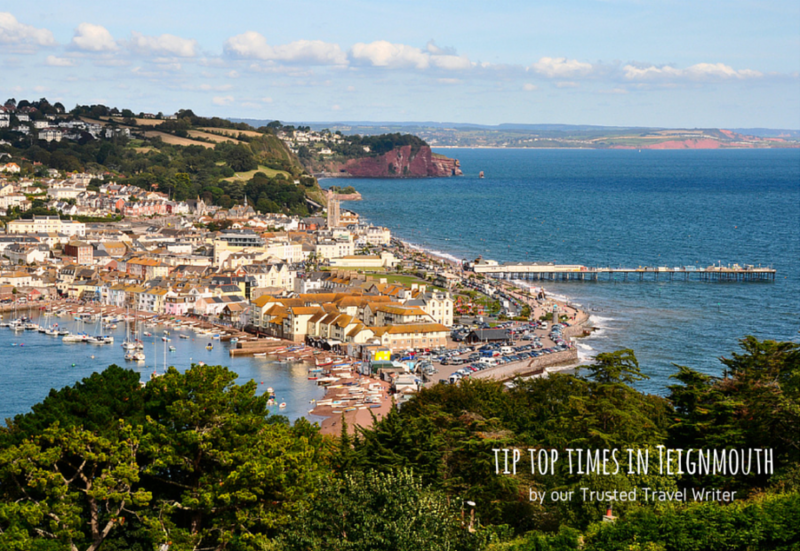 It’s the classic seaside resort, a wonderful unspoiled gem shining bright on the South Devon coast. Children love it. The grandparents love it. And parents love watching their children being children and grandparents reliving innocent times. It’s a town –not too big, not too small – at the mouth of the Teign estuary. It’s where the sparkling peaty water that’s gushed over granite through endless deep Dartmoor valleys finds freedom. River Beach is one of Teignmouth’s two beaches, the quieter side where the estuary ends and fishermen still mend nets, catch sand eels and moor their boats. Dogs are welcome on this beach all year round and if you look inland you may catch a glimpse of Dartmoor’s peaks beyond the beautiful estuary on a clear day. Boats will take you on adventures from here, either mackerel fishing (reeling in your own supper is pretty special) or across the river to the ‘quaint English drinking village with a fishing problem’, Shaldon. The alternative Teignmouth beach is Seaside Award-winning Town Beach, a broad strip stretching along the Victorian promenade to the pier and beyond – space for everyone to spread out buckets, spades and picnic blankets, and build impressive forts and moats. Children love hunting for ‘jewels’, colourful little pieces of glass smoothed by the sea. Water quality used to be a bit dodgy, but it’s much better now and it’s a dour visitor who can resist a dip in the sea below blue skies and warm sunshine. If you do jib, head for the seasonal outdoor lido that sparkles along the seafront. Away from the beach, Teignmouth has diversions aplenty. The Victorian Grand Pier, built in1867, is full of gaudy lights, strident music, air hockey hilarity and disproportionate thrills from the rattle of the shove-tuppence machines. It’s multi-coloured arcade escapism at its most fun. You resist as long as you can, but once in, it’s hard to force yourself, blinking like a mole, back into the daylight. For little children, the brilliant playpark is a magical wonderland of swinging, climbing, sliding and splashing through jets and fountains – a change of clothes is prudent. Scaling the Spiderman net to the very top leaves mini peers in awe. And for older children, the seafront skate park means hours of fun riding the ramps on skateboards and scooters; supervising with one eye from a bench with sea views is a pleasure not a chore. And when you’re sated with seasidy jollity, full of mini golf and cornets, you can head away from the sea, beyond the Georgian crescent, for a little retail therapy in all sorts of shops that are often independent and small enough to be special. Eateries come in all shapes and sizes too, from friendly pubs to brasseries serving local seafood. Watching the sun set over a cocktail is the best end to a wonderful day.